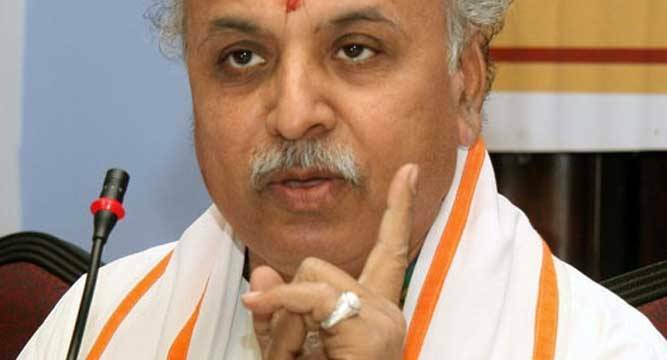 No agitation will be required for building Ram temple in Ayodhya since Narendra Modi is heading the government at the centre and he will ensure the construction by enacting a law, according to VHP president Pravin Togadia. “Till there is a government of ‘Bhai Narendra in Delhi, there will not be any talk of agitation (for Ram Temple)”, he told a VHP programme here. “Modi is a man of firm resolve and I am confident that he will ensure the construction by getting a law enacted by Parliament,” he said. The firebrand VHP leader demanded a special session of Parliament for enacting a law for paving way for contruction of Ram Temple as was done in the case of Somnath Temple when Sardar Vallabh Bhai Patel was the Home Minister. On the attack on Pathankot airbase and ties with Pakistan, he said any attack on the armed forces is termed as war. “Pakistan regards India as enemy and a policy should be framed regarding an enemy in such a way..,” he said.